Actually, I met Tevis (President of Cannonball and husband of CEO Sheryl) when we performed together at a concert while I was still in school. I said, “Nice sax.” He responded, “Thanks—I made it.” That was my introduction to Cannonball saxes, and I tried to get my foot in the door from then on. But they didn’t have room, so it wasn’t until a few years later that there was finally an opening. How many people do what you do? Do you see that number expanding in the foreseeable future? As far as the play-testing and acoustical work, there are just two of us. We stay very busy, and we might add another eventually, but we don’t have any current plans to. Is it an 8-5, Monday-Friday kind of gig? Kind of, but it’s a lot more fun than that sounds. Tevis and Sheryl are great employers who run a very successful company, but they also make it a lot of fun to work here. We can wear shorts and sandals and joke around, and if I have a late morning it’s usually not a problem. Of course, as long as I get my work done—I’m often here pretty late. And I do some traveling to trade shows and other events to mix it up a few times a year. But I work with musicians, which is also fun. Tevis is a woodwind player—he was a college bassoon major, plays all the double reeds, saxes, clarinet, flutes, etc., and was a performer/recorder before they started Cannonball; and Sheryl taught music at a middle school, and was also a performing saxophonist as well as a pianist and vocalist. Almost all of my coworkers are also musicians. So as you could imagine, it’s a quirky but fun atmosphere. From a business perspective, what’s unique about Cannonball? I’ve worked for large and successful companies in real estate, finance, and architecture, and there is one thing that really surprised me about Cannonball: the bottom line. All my past employers are primarily concerned with profit margins, and they base their decisions on that. It’s the business standard. Cannonball, by contrast, is primarily concerned with making great instruments. And it’s not just a nice mission statement or quote—when we’re developing or improving an instrument, costs are effectively ignored. Sound and quality are the focus. Most long-standing instrument manufacturers may have started with musician managers, but have since been passed from one businessman to another MBA until what we have today are efficient businesses that happen to make musical instruments (and that can’t figure out why musicians don’t like their current instruments as much as their 50-year-old horns). Cannonball is a bunch of passionate musicians who want to make great instruments. There are a lot of perks. My short three-mile commute, the variety of work that keeps things interesting, the great coworkers, my own soundproof office—they’re all great. But I love making saxophones that players and artists fall in love with. It’s a mixture of art and science what we do: manipulating the metal, changing the airflow to make the overtones line up right, to get the core sound to be rich and responsive with the right balances of resistant/free blowing, warm/edgy, focused/big, etc. When someone tells us their story of how they fell in love with their Cannonball, and they’re so excited they can’t put it down—that’s what it’s all about. 3-mile commute? That must be nice. Yeah, I rollerbladed to work one day just to say I did it. The worst part? Hmm. Sometimes we’ll get pounded with a surge of urgent orders and it gets pretty stressful. I’m not a big fan of high-stress situations. Fortunately it doesn’t happen all that often. Do you get free horns? Any other cool perks? Well, I don’t really need horns anymore. Whenever I have a gig, I just pick a horn off the shelf—maybe a prototype of a new design we’re testing, a new finish, or just whichever model I feel like playing that day. Or whichever one matches my outfit for the gig. Does working with saxophones all day affect your motivation to play outside of work? How so? Good question. Play testing only leaves so much room for actually making music, so more often than not it motivates me to go home and play more. Tevis has a nice setup in his home and records most evenings, testing out new models, new modifications, new mouthpieces, or just playing. Until I can set up my own studio, I go to jam sessions or play around at home. The only time I really get burned out is after a long trade show, where my ears are bombarded for days by deafeningly loud players all day long—that makes me crave silence. How did you learn to do the acoustic customization? How long did it take to get good at it? Did you ruin a lot of necks or horns in the process? Everything I learned about acoustic customization has been here under the Cannonball roof—a lot of it from Tevis and Randal, and a lot more we’ve discovered since. I had to practice for a few weeks on old prototypes and junk horns before I got the green light, but I didn’t ruin too many of them. What kinds of things can you fix or improve about a saxophone through the acoustic customization process? I’ll just say this: we have a lot of the top saxophonists in the world come through here, and so far, we’ve been able to make their horns do everything they’ve asked. How long do you spend working on each horn? It depends on the horn. We keep strict quality control at our factory so our products are exceptionally consistent; but no matter how tight our manufacturing tolerances are from an engineering standpoint, the horns will always vary in how they play. That’s why our acoustical customization is so important. Sometimes it only takes a few minutes, and sometimes I spend more than an hour on a horn before I’m satisfied. And it doesn’t leave until I’m satisfied. Is the ultimate goal to create a totally consistent product—horns that all play the same way—or are you trying to create horns with a variety of playing characteristics? When I’m working on an individual horn, my goal is to get it to fill its potential—to play as well as it can. So in that sense, yes, the goal is complete consistency. But from a design standpoint, the different models, necks, finishes, etc. provide varied flavors to fit musicians’ varied preferences. Most players recognize the “Cannonball sound” when they play any of our horns, but I still recommend playing as many as you can to find the one that fits you best. Could you, theoretically, take a horn from another maker and improve it? Absolutely—but I’d be fired pretty quickly if I did! What horns are you currently playing? Today I have a Vintage soprano in dark lacquer and a Brute Big Bell tenor checked out for upcoming performances. Last weekend it was a Raven alto and a black and silver tenor. Were you playing Cannonball horns already when you were hired? If you didn’t work for Cannonball, how likely is it that your current horns would be Cannonballs? Very likely . . . I’ve always been drawn to big and rich sounds, and to “efficient” horns that don’t get in the way of my music. Cannonballs fit me well. Do you secretly own and play non-Cannonball saxophones? If I did, it sure wouldn’t be a secret anymore! I sometimes fix up and sell old horns for fun, and I’ve occasionally taken them to gigs. I’ve regretted it every time though, whether because of the awkward ergonomics, inefficient sound, bad intonation, or a terrible combination of those. But even the newer “big name” horns always make me feel choked, especially up in the palm keys. Speaking of “old horns,” what’s your favorite? Each of the ones I’ve played has certain features that stood out to me: the old Conns and Bueschers have a big but velvety sound; Martins tend to speak very easily; Buffet SDA has great intonation; Selmers have good ergonomics and a rich core sound. I guess the best all-around vintage sax I’ve played was a near-mint SBA tenor at a shop in Tokyo, but I didn’t have the $25k they were asking for it. I know Cannonball is also making trumpets and clarinets. Are they as successful business-wise as the saxophones at this point? Is Cannonball likely to expand to other instrument lines? We were doing saxophones almost a decade before we added trumpets, and the clarinets are only a couple years old now—they’re doing well, but the saxes got a big head start. The Lynx, our new lightweight trumpet model, is really taking off, and the clarinets are making good headway too. We’re always open to new ideas and have invested a lot into a couple of new instrument lines, but we won’t release them until they’re perfect and the market timing is right. How much input do you have personally on new product development (if any)? It’s a team effort, so I contribute a lot to sax development, whether with new models or improvements on existing ones. I don’t work much with the clarinets and trumpets, but I still pitch in—I made the ergonomic register key on our student clarinet, and helped make the unique braces on our Lynx trumpet. Tell us about Cannonball’s new product development process. It usually starts with one of us getting an idea. Tevis will frequently show up in the morning very excited with something new to try. We turn our ideas into prototypes here at our finishing factory. Then we’ll have a number of musicians try it out, and others listen (Sheryl has better ears than anyone I’ve met). Of course, most of the time the new idea doesn’t work—we have a huge “graveyard” of parts and horns—but that’s the nature of brainstorming. Every once in awhile we’ll love it and send the specs to our factory and build it. Then it goes through another series of more rigorous tests. Again, a lot of new designs are shot down during that process. If we still like it, we’ll usually build a few more prototypes just to make sure; and finally, if it passes all of those tests, it gets added to the next production run of horns. We have a lot of perfectionists here, so it takes quite awhile before we give anything the final approval. Anything new on the horizon that you can tell us about? Cannonball offers a wide range of finishes on its saxophones. Why? The ideal sound and feel differs for every musician. Some want a big, fill-the-room type of sound. Others prefer a tight, focused tone. Some like it bright, some dark, and so on. Between our pro Big Bell and pro Vintage Series saxes and their varied finishes, there should be at least one model that hits the spot for every saxophonist. How large a role does the finish play when you are picking out your personal horns? It’s the icing on the cake, and when you’re picky, that makes a huge difference. I mean, you choose a particular horn because of a lot of things, but one of those is its sound. My numbers aren’t scientific, but I say 50% of your personal sound is determined by you (your body, your throat cavity, your mouth, your tongue, your embouchure, etc. ); 35% your mouthpiece, reed, and ligature; 10% the sax neck; and 5% the sax. We’re talking just the sound—think long tones. And of that 5% that the sax determines, most of it is in the design—the bore, the tone holes placement and size, etc.—and finally, a small portion is the finish of the horn. That’s why I say it’s the icing on the cake. Maybe even just the sprinkles on top. Anyway, my point is, for most pro saxophonists, a 0.5% change to their sound is very significant, just the way 0.1 second would be a massive difference in Usain Bolt’s 200m time. Less advanced musicians won’t notice the difference. Some pros don’t. But to me, who spends all day playing the same models of horns, any tiny little change is a relatively huge deal, and the finish absolutely does make a difference in the sound. (People will argue that all day long, but remember that those people who spend all day arguing it aren’t spending much time playing their horns…) Anyway, to answer your question: when I’m picking among different finishes of the same model for my personal gigging horns, the finish plays a very significant role. What are the most popular finishes? Everybody loves the Raven. The Brute is the newest addition, and has quickly moved its way up the ladder—I think it might already be in second. Should potential buyers be concerned about the Taiwanese manufacturing? We’ve all seen bad horns coming out of China or Taiwan. Any reason Cannonballs are different? I can’t speak for anything else that’s coming out of Taiwan, but we’ve spent the past 15 years continually training our team in Taiwan and today our factory, processes, and artisans are second to none. We make all of our saxophones by hand in our Cannonball factory, and the Cannonball factory only makes Cannonball saxophones. From our brass alloy, our bore design, our tone hole sizing and placement, etc. to the fit and finish of everything on the horn, Cannonballs are both unique and built to last. 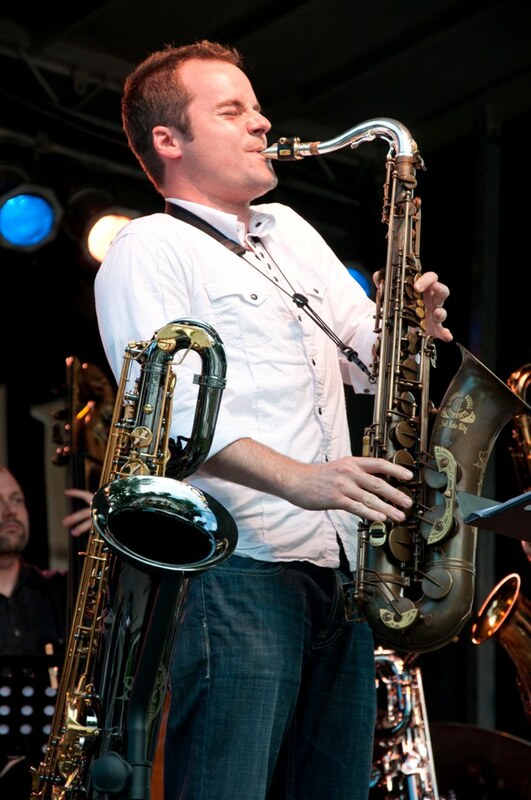 Do you find Cannonball saxophones to be particularly suited to certain styles of music? It seems that many of your endorsing artists play in a smooth jazz style, or something close to it. Ever heard the joke, “How many classical saxophonists can you fit in a phone booth? All of them!” You’re right that a large number of our endorsers are in the smooth jazz genre. But when you look at professional performing saxophonists, the numbers represent the same spread as our artists. We have some excellent classical saxophonists on our team, but there just aren’t vey many of them out there. The market doesn’t support nearly as many straight-ahead jazz musicians as it used to—which is also a tragedy—so those artists make up a smaller slice of our pie. When you look at concert venues, churches, radio, media, etc., you just see a lot more smooth jazz artists than anything else these days. We’re proud that a relatively even representation of musicians from across the board find themselves at home on our horns. Does Cannonball see itself as going head-to-head with “big” makers like Selmer and Yamaha in the pro saxophone market? Do you expect/hope to someday sell as many horns as they do (or more)? You’d be surprised if you saw the numbers of how many pro horns we sell compared to those guys. When artists are picking out new horns, our biggest competition by far are horns that are over 50 years old. In general, our biggest hurdles are simply (1) name recognition and (2) the “if it costs more, it must be better” mindset. We encourage players do a fair side-by-side comparison between our horn and anything else. Cannonball has an impressive artist roster. Any personal favorites or heroes? I’ve of course listened to a lot of their recordings, but it’s a night-and-day difference hearing them play right in front of me. Pete Christlieb’s luscious sound will knock you over. Gerald Albright has ridiculous bebop chops. Nobody puts more air through the horn than Marc Russo (I thought I’d have to repaint my office after he left). Branford Marsalis has great classical chops and a wealth of knowledge. Side note: not many people know that Cannonball doesn’t pay endorsers; in fact, all of our artists buy their own horns. We give them a great discount, but we never give horns away. We can proudly say our artists play Cannonballs because they truly want to. How can people keep up on the latest news from Cannonball? We post all the newest stuff on Facebook and Twitter, and educational and performance videos on YouTube. As promised, here’s the video of Ryan and the Cannonball crew doing their thing. All the soloists are worth hearing, but Ryan’s solo starts at about 3:40. Thank you for the post. It answered many questions I had about the new cannonball instruments. I can personally say that when I buy a new horn cannonball will seriously be in contention.